Sag Awards 2017 hit the best events list of the year taking place around a week. And while the whole world was concerned about getting political at the event that has nothing to do with politics, we better turn our attention to celebrity looks and styles. Today, we will consider black women hairstyles 2017 inspired by celebrity fantastic looks spotted on the red carpet. First of all, it is all about Taraji P Henson and her exotic dress. Semitransparent, or quite absolutely transparent in certain places, it left us without words to utter. However, her hairstyles was also impressive. The trendy bob cut with shaved side! Another notorious look was that of Janelle Monae with her unique double bun hairstyles. We could actually never before have thought that teen buns can get to the heights of red carpets. This Sunday night welcomed the 23rd annual SAG Awards. 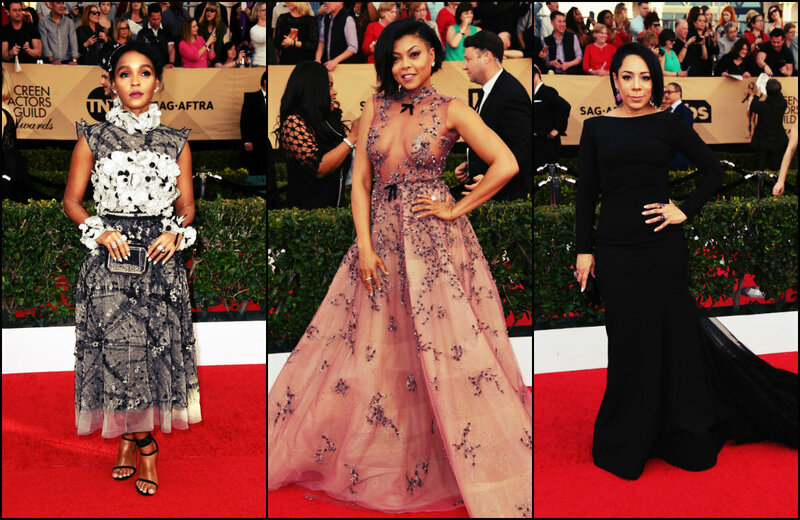 The red carpet was full of celebrities each one with her own style and vision of beauty. You call it anything but boring. Well, let us keep aside from the political topics and current situation that in reality has involved many top artist. But the truth is that the atmosphere of the rebel against the governing political system was seen in extravagant flowers and feathers on gowns, extreme jewel hair accessories, drastic make up and even safety pins that celebrities proudly revealed to photographers. Above all, red carpet introduced us the best SAG Awards 2017 hairstyles. Meanwhile the runways have already given us some ideas and directions, what we saw at the awards event was different. The cold days seem to be going away soon and soring will enter to its reign. I bet that many of us, ladies are already thinking about changing our appearance somehow with the coming of the warm days. No matter whether you have straight or curly hair, long or short, below you will find 10 hottest haircuts and hairstyles 2017 spring time will offer us. Gaining inspiration from the celebrities that always go one step ahead of time, here we are to witness the trending hair ideas. Dark auburn hair colors are naturally coming to our minds when the weather changes and winter enters to its reign. Step by step we seem to forget about our fanaticism around sunkissed blonde hair shades, even the most popular platinum blonde hair colors seem to fade away. Now we focus on shades that will make us feel comfortable. For fall/winter shades it is best of all to go for darker hues. You can start from honey brown if you were a blonde. Then go deeper until you get to burgundy and auburn shades. They will reveal a whole new world of emotions and passion. Once you try you will fall in love. Emmy Awards 2016 was held this Sunday and we can already look back and see best celebrity hairstyles and looks on the red carpet. Before we go to the styles represented, I have to tell that the event was a complete triumph of the Game of Thrones - the series tat has won the majority of awards so far in history. But the most memorable moment was not that, but Sansa Stark's (Sophie Turner) complete makeover, from copper red hair colors to creamy platinum blonde and there was the dress - the transparent black, yet elegant one that caught all eyes and became the most discussed dress of the Emmy's red carpet tis year. Braided hairstyles are adored by everybody, from kids to grown ups, from long hair owner to those with short cuts. And there is some reason for it - braids are meant for anything for anywhere and for anytime. No matter what are you going to do, be it just a night out, or official event, you can always rely on braids to have the appropriate look. Today we'll take a look at double braids, that are most often called boxer braids nowadays, that have made a lot of fuss recently and have become incredibly popular. Another year and another fantastic show at VMA 2016 with celebrity hairstyles and looks. Just last night the red carpet hosted all the most famous pop stars and now we can adore the best and worst choices at the awards. It is for several years now that we look back at VMA looks and with each year a lot changes, yet certain things remain unchanged - Video Music awards host the most daring and extravagant looks, that are worthy seeing, remembering and trying to copy at least once.